The image shows the motif on a handbag in progress. 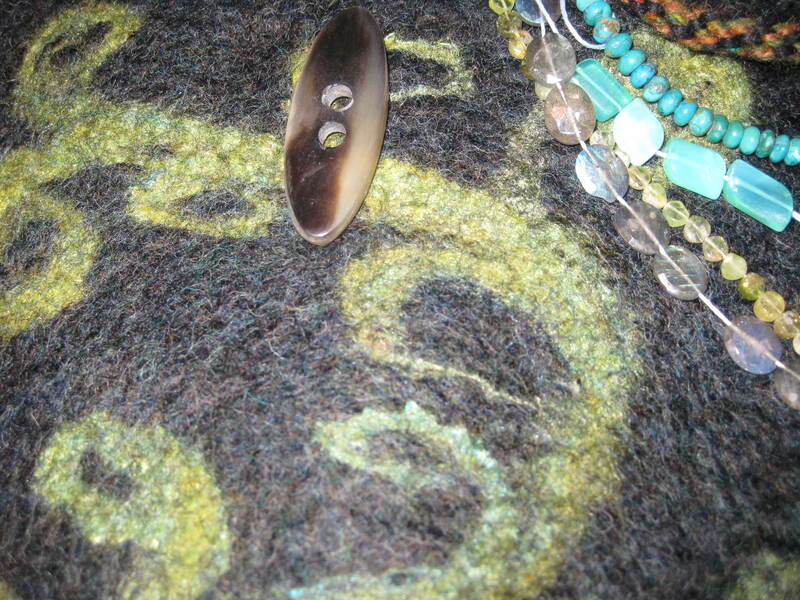 Greens and dark stone colors, and a swirling motif that echoes Celtic torcs and spirals. It’ll be embellished with various gemstone beading and a bone button, and have a twisted yarn strap that I wove a while ago. I’ve been thinking as I work in the studio about Ireland’s economic difficulties and about Ireland’s abundance of beauty and sheep, and it makes me think about Mahatma Gandhi’s vision and leadership, to encourage an “economic and moral regeneration” and independence in India, by his example of hand-spinning and hand-weaving cloth from India’s products. The 2011 International Day of Felt will be on October 1. On that day, feltmakers are encouraged to share their work, in public: exhibit, demonstrate, teach, post images, blog. I think other fiber artists might join in this public sharing and take our wheels, drop spindles, looms, crochet hooks, knitting needles out to our front porches, to schools and malls and work places and parks. Fiber artists — each with the same sorts of sorrows, joys, worries and frustrations as the general population — seem to me to be among the happiest people on the planet. Why is this so? We’ve found something to do that is peaceful, productive, good. I know that when I’m felting, my concerns get smoothed out along with the fibers on my work table, and it seems that life’s priorities become a bit clearer. When you can create beautiful, useful things, you are somewhat liberated from the addiction to consuming based on trends. When your sense of worth and satisfaction is home-grown and benign, there’s a sweet feeling of empowerment and well-being. For me, this is at the heart of feltmaking and the community of fiber artists who inspire others. We’ve got something beautiful here: let’s share it.